Welcome to The Tool Shack, where we have the largest selection of outdoor power equipment and construction equipment in Northwest Florida. We are family-owned and operated and have two stores, conveniently located in Gulf Breeze and Pensacola, to serve your needs. We are an authorized servicing dealer for the top brands in the industry. We stock lawn mowers, trimmers, chainsaws, blowers, parts, and accessories. Check out our brochures to see what we have. If you need help in making your selection, call or stop in—we're always ready to help! Our Service Department is staffed with factory-trained technicians to keep your equipment operating at peak performance. From minor tune-ups and maintenance to major repairs, we can get your equipment back in service quickly. Our technicians have EETC certifications and over 60 combined years of experience. Our Parts Department stocks OEM and aftermarket parts for most brands. We carry belts, blades, cables, filters, spindles, tires, and more. If we don't have it in stock, we can normally have it within just a few days. Our Rental Department has a wide selection of tools and equipment to help you complete most any job or project. We have over 40 combined years of experience in the industry and can help you choose the right tool for your job. Our rental experts will give you proper training and demonstrate how to operate the equipment. No matter what your problem is, we can provide a solution. 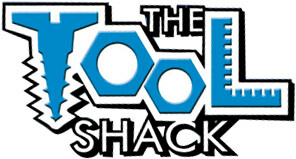 At The Tool Shack, we are your solutions experts! Have a broken lawn mower? Have a big remodel project planned? Call or stop by; you'll be glad you did.